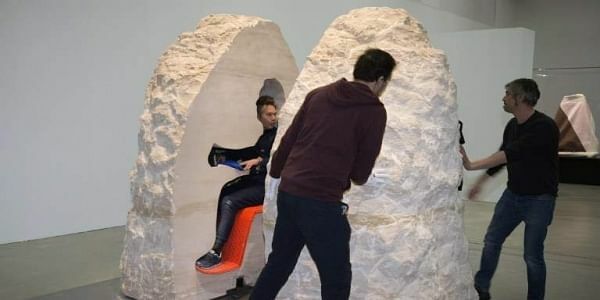 Abraham Poincheval, 44, had difficulty walking as he was helped from the stone onto a chair before being taken away for a medical examination. PARIS: A French artist emerged from a week entombed inside a 12-tonne rock Wednesday and said he was "a little stunned" by the experience. His extreme performance in a Paris art museum has become something of a sensation in the French capital, with crowds thronging the Palais de Tokyo to watch him inside through an infra-red camera. Hundreds have tried to talk to him through a crack in the rock, with the artist telling AFP that some had read him poetry, played guitar or told him about their dreams and nightmares. Poincheval, who previously spent a fortnight sewn-up inside a stuffed bear, had earlier told AFP through a crack in the limestone boulder that his confinement had been "like tripping". "I am travelling in this rock without moving, like an astronaut," he said, buoyed up by the fact that he had "got into people's heads". Poincheval carved out a hole inside the rock in his own image, just big enough for him to sit up in, with a niche to hold supplies of water, soup and dried meat. Dubbed France's most extreme artist, he will attempt to become a human hen later this month and hatch a dozen eggs by sitting on them for weeks on end. Lack of sleep rather than claustrophobia was his biggest worry inside the darkness of the rock, he said. Without a watch -- and with only an emergency phone line -- he had no way to tell the time. The artist could only move his feet and hands a few inches, and had to store his excrement around him. But he assured AFP at the weekend that there had been "no accidents" peeing into his empty water bottles. Emotionally, however, his time inside was something of a rollercoaster, he said. "It's very complex. You pass from one feeling to an another. Like you are being carried away on a raft," he said. "It's like tripping. I am trying to explain (the feelings) in language but it very difficult to put down in black and white." He ate worms and beetles while living inside the bear, was buried under a rock for eight days and navigated France's Rhone river inside a giant plastic corked bottle. He has crossed the Alps in a barrel, and last year spent a week on top of a 20-metre (65-foot) pole outside a Paris train station. The artist also spent 20 days underground as a human mole, lived like a Stone Age man and had himself walled into a cave for a night with hundreds of mosquitos. Unorthodox ideas seem to run in the family. His inventor father Christian, who sports a bowler hat and a white Santa Claus beard, is best known for coming up with pills that make farts smell of roses, violets and even chocolate.